I thought the color of the gown complemented her complexion perfectly. I loved how whimsical it was. Very classic yet modern. I also adored her acceptance speech and the fact that she uses the same lip balm that I wear and sell (Clarins Hydraquench). Kate Hudson in Atelier Versace. This was very reminiscent of Gwyneth Paltrow's Tom Ford gown from a couple years back but I loved it none the less. She looked stunning. I also loved her hair and makeup. While this was a very safe selection in my eyes, it's also incredibly timeless. She looked regal in this gown and her hair and makeup was also on point. Cate Blanchett in Giorgio Armani. She seems like she has such a spectacular sense of humor so hopefully she wouldn't be offended if I said this look gave me a little bit of Britney circa 2000 MTV VMAs vibes. Perhaps a little young for her but still gorgeous. I love anything girlie that sparkles so this is a big winner in my eyes. Jenna Dewan-Tatum in Reem Acra. Next in line on the feminine glitz and glam train is Channing Tatum's beautiful wife. Nothing we haven't seen before on the likes of red carpet pros like Penelope Cruz or Eva Longoria but still incredible. Camila Alves in Gabriela Cadena. She always looks incredible on the red carpet. I loved this shade of pale pink on her. True elegance and sophistication from the lady with the best date of the night. I loved the train on this dress. The neckline and adjoining straps kept me intrigued. Very well-proportioned. Classic with a twist. She wore this perfectly. 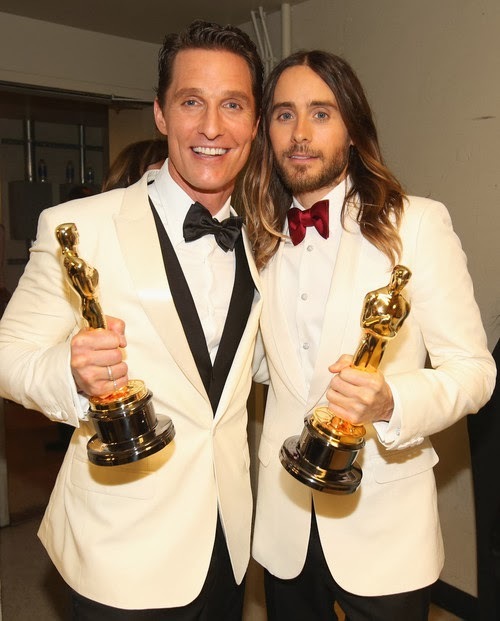 Acadmey Award Winners Matthew McConaughey in Dolce & Gabbana with Jared Leto in Saint Laurent. Kevin Spacey in Burberry. Love a man in a blue suit. & The Brads, both in Tom Ford. Bradley Cooper & Brad Pitt. In all honesty, one of the main reasons I look forward to awards season is because of the red carpet fashions. But this year, up until The Oscars that is, I was so uninspired that I didn't even bother to post best dressed lists for The Golden Globes, SAG Awards, etc. The stars must have been holding out for the big night because just about everyone looked phenomenal. While the show itself tends to be boring, I'll give it to this year's producers because it was actually quite entertaining. I think that the winners' speeches and the "approachable" and familiar nominees had something to do with it. The Academy even managed to salute one of my favorite films of all time, The Wizard of Oz. For that, I'll forgive them for all of the Gravity hoopla. Now that's a movie I would never recommend.